Region: Montford Historic District, Blue Ridge Mountains, Ashville North Carolina. The Lion and The Rose c. 1895 has been faithfully restored to its original elegance. Its rooms are uniquely furnished and decorated with antiques, Persian rugs and period appointments, while incorporating discriminate adaptive use to provide our guests with every possible convenience. High embossed ceilings, golden oak, classic leaded and stained glass windows create an atmosphere of welcome and charm. A delightful breakfast and afternoon tea are served from lovely silver and English china in the gracious dining room or you may choose the wide verandah overlooking the park-like setting with its 100 year old Sugar Maples and flower gardens with fountains all outlined with a scalloped picket fence. Five guest rooms. all with queen sized beds and private baths are all unique. 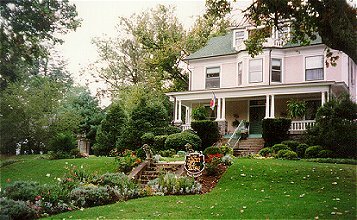 Special amenities including fresh flowers, turndown, full gourmet breakfast, afternoon tea, robes and much more are what make The Lion and The Rose one of the pre-eminent bed and breakfasts in the southeast. This and other Asheville Bed and Breakfast Inns can be found here in The Register.